Donald Trump speaks town hall at second presidential debate at Washington University on October 9, 2016. 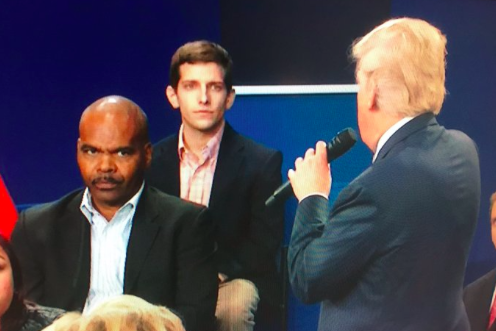 Heading into Sunday night's second 2016 presidential debate at Washington University in St. Louis, all eyes were on Republican candidate Donald Trump in the wake of his offensive comments recorded during an appearance on the set of "Days of Our Lives" for a 2005 cameo. Political observers and many American voters, including outraged conservatives, have condemned Trump's sexist remarks and questioned whether he can effectively recover from the issue over the final month before the Nov. 8 election. Twitter was quick to rule on Trump's handling of the barrage of questions served up to him by Anderson Cooper and Martha Raddatz. Locker room talk = things that sexual assaulters say? When Trump says it's just "locker room talk," he's defending the very culture that normalizes sexual assaults on women. By the end of the debate Trump will wish he had stayed in the locker room. Note to self: Do not go into the Locker Room at Trump University.